In February 1861, Nast returned to New York after his adventures in England and Italy, where he sent back illustrations of Guiseppe Garibaldi and the Italian War for Independence. Assigned by the New York Illustrated News to cover Abraham Lincoln’s first presidential inauguration in March 1861, Nast received an official letter of introduction from Horace Greeley addressed to John G. Nicolay, private secretary to President-elect Lincoln. During the days leading to the March 4 inauguration, Lincoln, Greeley, Nast, and other politicians and journalists resided in the famous Willard Hotel in Washington, D.C. According to Nast biographer Albert Bigelow Paine, the cartoonist recalled that sectional tension on the eve of the Civil War produced in the hotel an “atmosphere [that] was charged with foreboding … [and] strewn with ominous incidents” [Thomas Nast: His Period and His Pictures (1904), p. 74]. 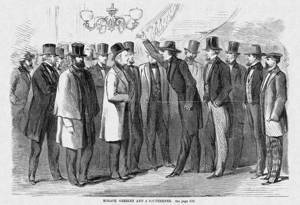 The March 23, 1861 issue of the New York Illustrated News carried Nast’s sketch of a Southerner vocally confronting Greeley in the hotel lobby. The illustration, in which the editor wears his trademark white coat, may be the first instance in which Nast drew Greeley from life.